After finishing up the Fool's Journey, I admit I found myself at loose ends for a little bit, wondering which direction to take things next. Having looked briefly at the court cards already, I figured a closer examination was warranted. However, I'll break here and say that should anyone have questions, anything you'd like to know, and/or were afraid to ask, let me know- I've hopefully set up comments on this blog correctly, so there's that option, or just email me with whatever you'd like to know. If I don't know, I'm sure I can find out. So here we are at the Pages. Also identified as Princesses in some decks, I've also seen them called Elementals once as well. 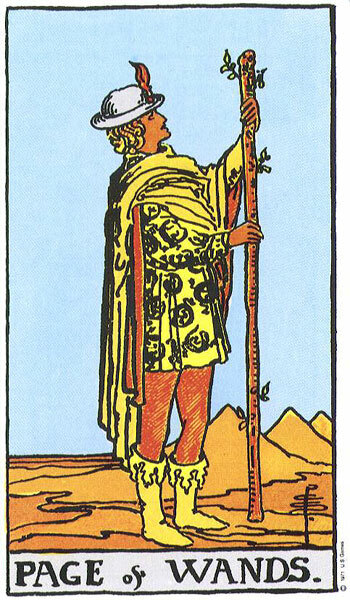 I find the Pages to be some of the more complex cards to understand, even though they represent the youngest, least mature aspects of either the person the reading focuses on or an inexperienced, untested person. To cover the first aspect of the Pages, we have a young person- someone, perhaps a student, who is inexperienced but developing. There are correspondences between the court cards and the elements, as well- Pages correspond to the Earth element, Knights to Air, Queens to Water and Kings to Fire. So to sum up the Pages- here we have a younger person, (some systems assign Pages and Knights based on gender, however I find this is somewhat arbitrary) inexperienced yet enthusiastic. If there are no young people in the reading, the Pages take on a curiously related but different meaning. 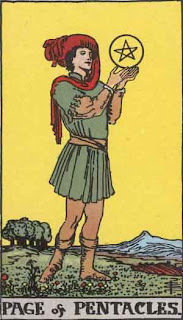 Here we find an indication of a message or new information coming our way- the Page can represent a messenger. The term "Page" comes from the chivalric codes of the Middle Ages, when Page was the term used for a knight's servant, assistant and trainee. Here we see the concept of a learner- the Page would begin training ultimately for knighthood, and would generally come from a noble family. So also there's the sense of a messenger here- the Page would serve as the messenger for his knight, running errands and delivering messages. So, to see a Page is literally to get ready for a message, or to expect a message coming your way. This message, then, can put you in the situation of being a new student- starting to learn something new. But what about the specific Pages themselves? Well, as we know, there are four, one for each suit. Each one has both the common factor of being in the same court position, and has the unique characteristics of their suit. This gets even more complicated when you consider that there are two levels of meaning in them as well. But never fear, dear reader, I shall guide us through. First, let's consider the Page of Wands. Here we have, first and foremost, what can be described as Earth of Fire. Earth refers to the Page, Fire to the suit. So here we have a potential, coupled with tremendous energy and enthusiasm. Which way will this energy be directed? That's the real question this card asks. This person is full of natural energy and enthusiasm, always exploring something new, and always looking to lead and be the center of attention. So as you can imagine, this can go one of two ways- this person can develop into a strong and confident leader, or can get attention for all the wrong reasons. When it bears the meaning of a message, it's important to remember that excitement and enthusiasm will serve you well, but at the same time keep a clear and realistic perspective on the situation- don't allow yourself to be led down false paths, make sure that your energy is directed in the right way. Next up, we have the Page of Swords. Again, we see Earth, and here Air as well. This may seem like an odd combination, but keep in mind the role of Earth- it's the generative, passive principle- it is acted upon, and in this way contains tremendous potential there. Which direction that potential goes in depends on how and in what ways the energy is used. The Page of Swords can be a tricky one. 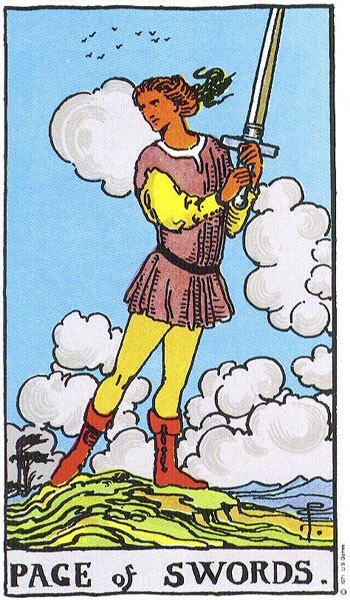 Keep in mind that Swords are tied to the element of Air, and this is the realm of both thoughts and ideas- communication as well is here. So keep in mind that the Page, being a Page, will want to jump on every new idea. If it's a new message, expect it to be about ideas, or a new communication or development. But take the time to test it out and see that it's accurate and true before passing it along or acting on it. 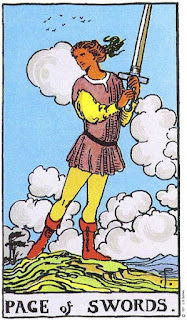 In terms of the person this card represents, this person is a natural communicator and thinker- always talking, writing, putting ideas out there, either on paper or in the ears of others. But the sum total of the Page is that they want to know everything, learn everything, and know everything. The problem with this is that like all Pages, this person can tend to be somewhat self-absorbed. They may not realize (or not care) that what they say and tell may be hurtful to others. So a reminder to be tactful is here also. At their worst, this person could be a gossip, manipulative, or a tattler, perhaps even unconsciously so, but nonetheless, the results are the same. 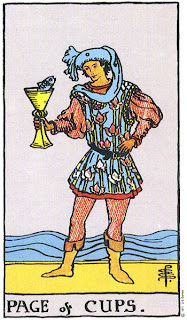 On to the Page of Cups. This Page represents Earth of Water- here again we have the potential of Earth, here with the emotional and spiritual aspects of Water. From the first time I saw this card, I always wondered what the relationship between the Page and the fish is. Are they talking? Somehow the Page doesn't seem overly surprised to see the fish there, and the fish almost looks like he's talking to the Page. 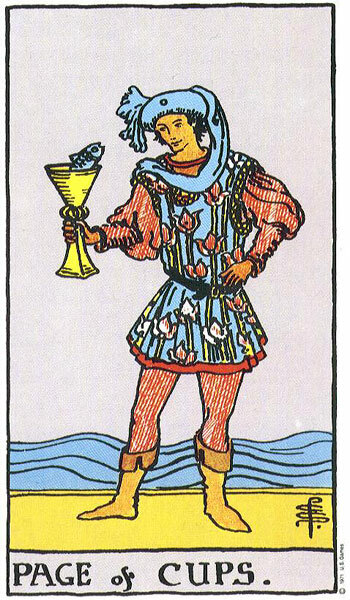 This presents another interesting aspect of the card, as in terms of a message, the message may seem improbable or unlikely, as would pretty much anything a talking fish could tell us. But the message will deal with family, or deep feelings- a new relationship, or the opportunity for a new relationship, and a confession of feelings. As a person, this Page will tend to be emotional, without a trace of callousness. This can be a good thing, and a bad thing. They may tend towards changes of mood, as well, but are optimistic and believe the world is a fundamentally good place. Not a bad attitude to have, all things considered! But this person may tend also to get beaten down over seemingly trivial things, and have a hard time separating their own emotions from the world around them, and get lost in their own ruminations. Finally, the Page of Pentacles. This Page is a little simpler- Earth of Earth. In other words, just the raw potential of the element, usually tied to luck or the material world. 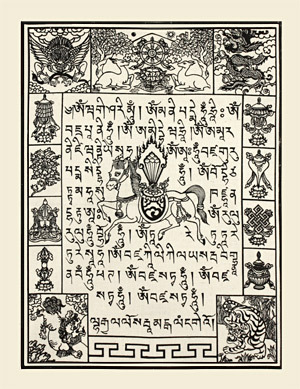 In terms of a message, this Page represents an unexpected turn of events, perhaps an unforeseen windfall, or turn of fortune putting you in a good position. The Page here is kind of expressive of this- seeming to hold a pentacle like it's something mysterious- what should he do with it? Again, the question becomes, how do you want to put this to use? 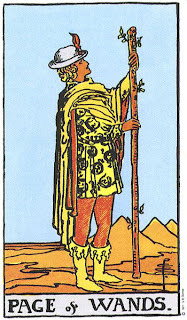 In terms of the person the Page represents, this person might tend towards being very serious, and being very industrious, always working and wanting to create something. Though this can be a useful trait, the Page can sometimes become overly serious, perhaps obsessive over the details, and may regard others simply as means to an end, at the cost of friendships or relationships with others. Again, it depends how the energy is directed and nurtured with the Pages. So from this, to see Pages in a reading indicates forces are working, either out in the open or behind the scenes, and will soon be revealed. The result could be either positive or negative- the message that's coming to you when you see the Page or Pages is that it's up to you what you want to do with this new development. It's an exciting time, full of potential- just be sure that you follow through and feed this potential the energy it needs, and guide it along the right paths.